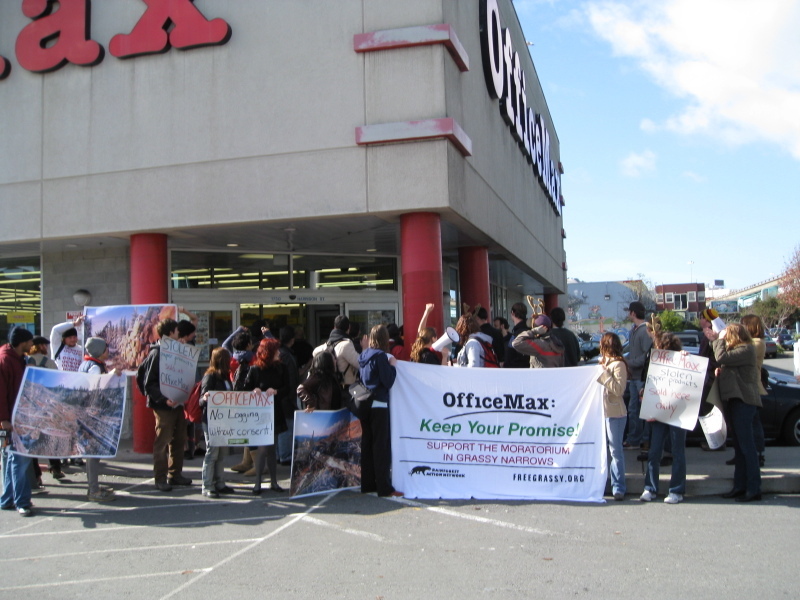 For the past year or so, OfficeMax and Canadian office-supply store Grand & Toy have faced criticism by Rainforest Action Network (RAN) and other activists for selling paper products derived from controversial clear-cut logging in Grassy Narrows, a boreal forest community of First Nation indigenous people in Ontario. According to RAN, a year ago OfficeMax pledged to help resolve the situation, but there have been few signs of progress, and meanwhile the clear-cutting continues—despite the First Nation’s repeated calls for a moratorium. So, RAN has organized a day of action tomorrow at some 30 locations of OfficeMax (and Grand & Toy, for Canadian readers) to encourage the retailers to honor their commitment to a community that has already faced more than its fair share of troubles. The San Francisco action takes place tomorrow, Jan. 30, at noon at the 1750 Harrison St. location of OfficeMax (cross street Duboce, not far from the 16th Street BART stop). I’m going to try to be there, and I encourage others to join me.